Does Judaism Allow Organ Donations? Modern medical technology has made it possible to transplant hearts, kidneys, pancreases, corneas, lungs, and livers from one human being to another. Organs can be transplanted from a dead person to a live person if certain post-mortem conditions are maintained, and organs like kidneys (of which most people have two) can even be transplanted from a live volunteer donor. Initially, there were many ethical and halakhic questions regarding organ transplants. Now, however, there is an unusual amount of official—even cross-denominational—agreement about the solutions to these questions. With all transplants there is a danger of rejection and complication. Any time a person receives an organ there is the possibility of experiencing more harm than good. In addition, a live donor risks complications from donor surgery. Deuteronomy 4:9 commands, “Take heed to thyself and keep thy soul diligently,” and this verse was interpreted by the Talmud and by Maimonides to mean that a person is obligated to avoid dangerous situations. Can a person ever purposely endanger herself? This is one of the primary ethical questions in regards to organ donation, both for the donor and the recipient. Many of the other questions about organ donation revolve around the treatment of a dead donor. Jewish law prohibits deriving benefit from a cadaver, mutilating a dead body, and delaying burial. All of these laws must be transgressed in order to transplant organs. However, according to most authorities, all of these concerns are overridden by a single halakhic (legal) concept: pikuach nefesh—the Jewish obligation to save lives. Thus a person is allowed to put herself in a reasonable amount of danger if it is likely to save a life. In addition, we may waive the normal prohibitions regarding cadavers when a person’s life is at stake. Ultimately, the critical issue with organ donation is defining the moment of death. According to the Talmud, a person is considered dead when a feather held below his nose doesn’t move and when an ear pressed against his chest does not detect a heartbeat. However, defining death these days is not so easy. One’s heartbeat can be maintained by machine even after one loses brain stem function and the ability to breath on one’s own. Do we define death as the cessation of brain activity or heart activity? 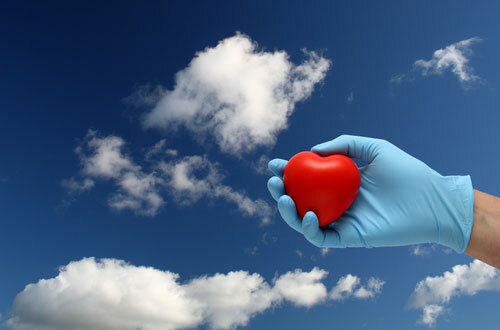 As long as a person’s heart still beats, organs can routinely be harvested, even if brain activity has ceased. However, once a heart stops beating, organs are deprived of oxygen, and it becomes more difficult to successfully remove and transplant them. If Judaism defines death as cessation of brain activity, than organ transplants are a viable option for Jews. If we define death as cessation of heart activity, then removing an organ prior to this point would be murder. Pikuach nefesh does not override murder; one cannot kill someone to save another’s life. Today there is near unanimous agreement about this issue. In the late 1960s, the Conservative and Reform movements both accepted cessation of brain activity as the Jewish definition of death. Twenty years later the Orthodox chief rabbinate of Israel endorsed the same definition; in 1991 the Rabbinical Council of America, an Orthodox rabbinical organization, followed suit. In 1992, Rabbi Shlomo Zalman Auerbach, a leader influential among the ultra-Orthodox both in Israel and the U.S., also accepted this definition. He suggested, however, that in addition to brain death, the heart must stop beating for thirty seconds before vital organs are removed. The fact that most authorities approve of organ donation does not mean that it is an archaic topic. There are many legal and ethical issues that are still debated. If several people need a given organ, how do we decide who gets priority? Can organs be sold? Can they be used without permission? In addition, in recent years, Jewish institutions and organizations have gone beyond approving organ donation; they have begun to actively recommend it, as an opportunity to fulfill the positive commandment of pikuach nefesh. However, the Jewish community still has a poor track record of post-mortem organ donation. Much of this has to do with the widespread and longstanding misconception that Judaism forbids organ donation This issue is being addressed now by the major denominational institutions, as well as new organizations, such as Operation Pikuach Nefesh, devoted specifically to educating the Jewish community about the importance of organ donation. Sign up for a Journey Through Grief & Mourning: Whether you have lost a loved one recently or just want to learn the basics of Jewish mourning rituals, this 8-part email series will guide you through everything you need to know and help you feel supported and comforted at a difficult time. The Jewish position on abortion is nuanced, neither condoning it nor categorically prohibiting it. Traditional rabbinic authorities forbid instigating the death of a terminally ill patient. When someone can be officially determined dead depends on one's interpretation of a key passage in the Talmud.